Last year when I was in Israel it was my great privilege to spend a fascinating few hours with George Deek, the young Christian Arab Israeli diplomat whose speech about being a Zionist went viral around the time of the 2014 Gaza war. He took my companions and me around his beloved hometown of Jaffa (the second oldest existing city in the world), where his family has lived for over 300 years. George with his aunt, grandmother, and mother. We visited a beautiful Ottoman Empire mosque, his grandmother’s home, walked along the waterfront and wandered through the twisting lanes. George talked to us about his youth, his family’s history and what his relatives think about him being an Israeli diplomat. After our tour, we had dinner in the stylish Sarona market in Tel Aviv, which not long before had been the site of a terrorist attack. I wish all of Israel’s critics could travel to Israel and see its diversity for themselves. The state has been built by people from over 100 countries, and has large minorities of Christians, Muslims, Druze, Bedouins, Circassians, Baha’i and so forth. I loved being able to talk to people from all walks of life about their backgrounds, and how they or their parents or grandparents ended up in Israel. The Arab citizens of Israel have chosen Israel to be their homeland, despite the internal and external challenges they face. George’s story is a reminder that many Israeli Arabs as well as Jews have been buffeted by forces – wars and foreign powers – beyond their control, and have histories of terrible heartache, trauma and upheaval. Yet while that suffering may be embedded in one’s consciousness, it does not have to define one’s identity. The story of Israel is of a people – Jewish and Arab citizens alike – overcoming hardship, and building an amazing, vibrant, successful, restless, multi-faceted, democratic state. That is as much George’s family’s story as any other Israeli’s. George, a dignified, quietly-spoken and yet charismatic young man, understands that peace does not come from dwelling on the past or a competition as to who has greater grievances. It will come from empathy and a shared vision, which he certainly has. As I talked to him, I couldn’t help but wonder, in the same way that his interviewer with the Jewish Journal obviously did, whether I was looking at a future Prime Minister of Israel, and imagine a world in which that could be so. On a balmy day last summer, a charming young Israeli is touring me through Jaffa, where he lives, trying to talk over the noisy gusts blowing off the Mediterranean. He stops on the Mifrats Shlomo Promenade, a few blocks from the beach, and looks up to admire the Mahmoudiya Mosque. It’s clear my guide knows the history of this city as well as any scholar, and he rejoices in telling the stories behind every stone. He is an evangelist for Jaffa, elegant, ancient city of the Bible and multicultural melting pot of modern Israel. Everywhere he looks, he sees the torrents of history fuse with the miracles of modernity: an old prison has become a luxury hotel; a dumping ground once known for crime and economic exploitation is now a beautiful seaside park. His rosy views are unusual in a complicated place like Israel. Most people associate the Jewish homeland with conflict, violence and endless Jewish-Arab tension. But not my guide. He sees only coexistence and possibility. Jaffa is the place his family has called home for generations, and he possesses a passion for this city so typical of Jews for their homeland. Only, my tour guide isn’t Jewish. Nor is he a tour guide. He’s Arab. And he’s an Israeli diplomat. Meet George Deek, the 33-year-old wunderkind from Israel’s Ministry of Foreign Affairs and, currently, the agency’s highest-ranking Arab statesman. Although his career there began only in 2008, Deek already has made his mark: He served as ambassador to Nigeria at the tender age of 25, and at 28 became acting ambassador in Norway, serving as Israel’s most senior spokesperson during the 2014 Gaza War. Deek’s position makes him a striking anomaly in a country that has a tenuous relationship, at best, both with the Arabs within its borders and the Arab nations across the Middle East. As such, he’s viewed through a kaleidoscopic lens — as a symbol of the role Arabs could play in Israel’s democracy, but also as a subject of suspicion: Whose side is he really on? And yet, for those seeking to move past the black-and-white dichotomies of the Arab-Israeli conflict, Deek represents something new: He is part of a growing movement of Arab Israelis who, rather than fight for a Palestinian state, are choosing to improve the quality of their lives within Israel. Both Jews and Arabs look to him as a kind of test case, and wonder: Will this work? Elad Ratson, director of research and development for Israel’s Ministry of Foreign Affairs and a longtime friend of Deek’s, describes him as a pioneer in a societal shift. “The Arab community of Israel is beginning to understand that there’s a way to promote their own community needs by working from within the system,” Ratson told me. When Deek first enrolled in the academy that trains candidates for the ministry, Ratson said some dismissed him as the agency’s “pet Arab” and assumed he’d “never be allowed access to real power.” Deek proved them wrong. A graduate of Radzyner Law School in Herzliya, Deek recently took time off from the ministry to study on a Fulbright Scholarship at Georgetown University in Washington, D.C. During his spare time, he bolstered his credentials — and his reputation — on the American-Jewish speaking circuit. But his most significant achievement came in March, when the ministry promoted him to adviser to Yuval Rotem, director general of the Israel Ministry of Foreign Affairs. That effectively places Deek in the ministry’s inner sanctum, among the most powerful few in Israel’s foreign service after Prime Minister Benjamin Netanyahu. In a small, competitive country like Israel, where good jobs are not easy to obtain — even if you’re Israeli — Deek’s resume is exceptional. Even staunchly pro-Israel groups that resist dialogue with Arabs have invited Deek to speak, embracing his inclusive message. His very existence in Israel’s upper echelon seems to suggest that Arabs have it good there. But Deek is in a difficult position. He’s part of a distrusted minority in Israel that must fight for equal opportunity at every turn. He’s an outsider among Israeli Jews and and outlier among Israeli Arabs. And as accomplished Arabs in Israel discover sooner or later, successful integration can bring accusations of betrayal. With or without approval, George Deek is the eternal optimist, and his vision for the future of Israel and the Middle East sounds as promising and hopeful as those articulated by former Israeli leaders Yitzhak Rabin and Shimon Peres. The question is: Is Israel’s democracy confident enough to indulge his aspirations? Alahu akbahr … Allahu akbahr. In midafternoon, the Muslim call to prayer begins and the city trembles with sound. Deek chants along with the muezzin as we walk through an outdoor amphitheater near the Orthodox church where he worships. Dressed in khaki shorts and a T-shirt, he retains a dignified air. He has handsome, chiseled features and speaks in a confident tone. For a public official, he is surprisingly relaxed and candid, blending in easily as an ordinary citizen, even as most everyone seems to know him. “I’m more careful when I wear a suit,” he quips. Deek may be the ultimate hyphenate, considering himself a Palestinian Arab-Israeli Orthodox Christian from Jaffa. Although he laments that it narrows the pool of eligible women he could marry, he mostly sees his identity as a professional advantage. If he were a Jewish diplomat, audiences might tune him out as predictable. As we walk, another mosque nearby begins its afternoon prayers. Deek sees Israel’s multiculturalism as its life force, the very thing that distinguishes it from its more monolithic Arab neighbors. In many ways, Israel’s struggle to exist as a Jewish-majority state in an Arab-majority region mirrors Deek’s own. Many would prefer that Deek follow the playbook of Arab leaders in the Knesset, who use their leadership to criticize Israel and defend the Palestinian cause. But Deek believes Arab citizens of Israel want something different. For as long as he can remember, Deek bobbed back and forth between disparate worlds. He grew up with two sisters near the Ajami neighborhood of Jaffa, where his father ran a successful tax advising office. He was active in Boy Scouts and marching band, and he participated in Arab-Israeli coexistence programs. But even as he involved himself in his Arab Christian community, he was always surrounded by diversity: Catholics who spoke French, Muslims, Christians, Druze and Jews. His description of primary school sounds like a comedy sketch: “It was a Christian school with a majority of Muslim students in a Jewish state in the Arab Middle East. In the late 1990s, he attended a Jewish high school where he was the only Arab in his class. He remembers this as a “pivotal period” that shaped his politics. Integration into Israeli society came naturally to Deek, but there was always a gnawing feeling that he was a fish out of water. When he started at the foreign ministry, he quietly forged ahead, letting the world believe he was just another Israeli. But later, he felt compelled to “come out” as Israel’s Arab diplomat, during a speech he gave in Oslo in 2014. And ever since, he’s had to justify his choice to serve Israel’s government: Jews tend to test his loyalty to Israel while Arabs test his loyalty to his tribe. Europeans don’t know what to make of him. It wasn’t only Israel he wanted to convince, but the entire Arab world. Deek draws easy comparisons to what has happened in recent years to other Middle Eastern minorities such as Yazidis, Kurds, Christians in Arab lands, Sunnis in Shia lands, Shia in Sunni lands and so on. “You know how they say the hate that begins with Jews doesn’t end with Jews? If we [Arabs] are unable to accept a Jewish state, then we’ll be unable to accept other minorities in our midst. Our only chance of surviving as a people in the region is by accepting a Jewish state. And yet, the creation of the Jewish state tore apart Deek’s family. Today, he has Palestinian relatives scattered all over the world, and Israel’s immigration policies haven’t made it easy for them to return. But where some see a legitimate critique of policies designed to preserve Israel’s Jewish character, Deek sees charges of racism. 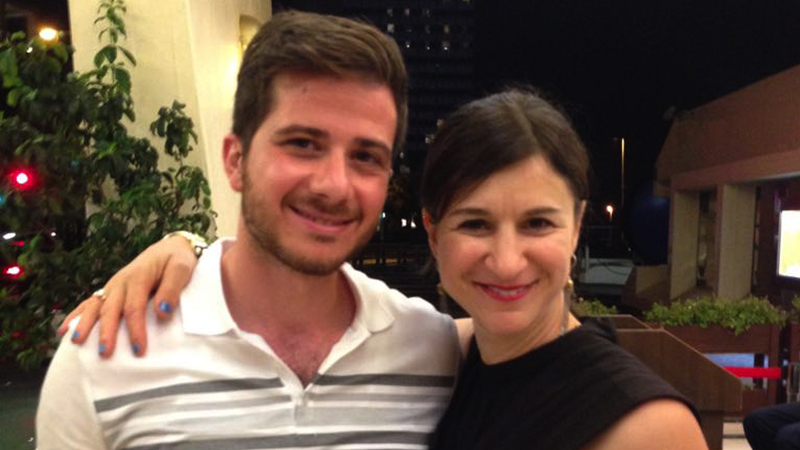 When Israel was fighting for its independence, Deek’s grandparents fled to Lebanon. As he tells it, Arab leaders convinced the community that if they stayed in Israel, the Jews would slaughter them. If they left temporarily, they could return after the Arabs won the war. But when that didn’t happen, many in the Palestinian community found themselves displaced and disillusioned. Deek’s grandparents did not wish to spend their future living as refugees in Lebanon, so they risked the return to Jaffa, smuggling themselves over the border into Israel, where they were then illegal refugees. Deek’s grandfather was quickly arrested and thrown in jail. 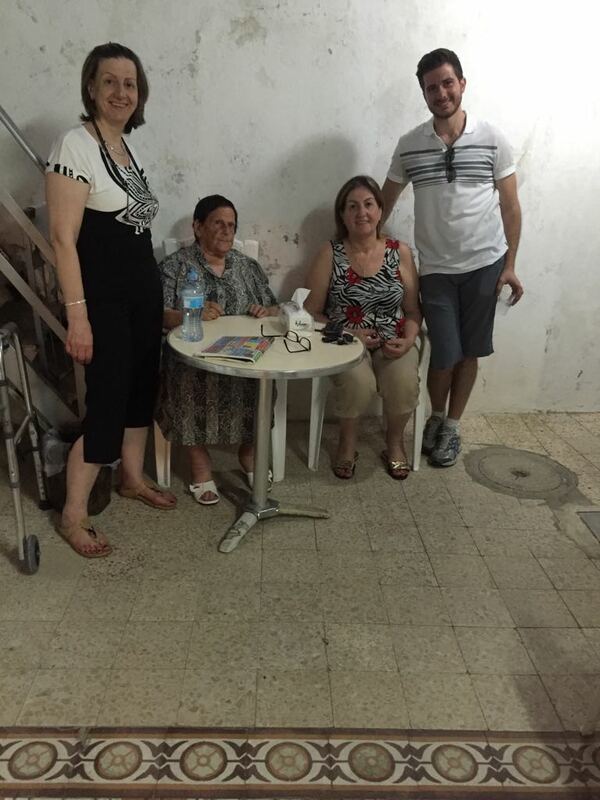 Jewish co-workers came to his aid and enabled his return to Jaffa. But by then, the city was traumatized and abandoned, a shadow of its former self. “Out of 70,000 Arabs who lived there, less than 4,000 remained,” Deek says. “So it wouldn’t be surprising or disappointing if my grandparents spent the rest of their lives in sadness. They had every reason to sit and grieve, to be angry. They even had reason to seek revenge. But they didn’t. Instead, they built a family, they found work, they built careers, educated their children, and provided them with opportunities. Deek’s constructive thinking is a lot to ask of an aggrieved people. How can a community afford to be generous when it has lost? Deek says this is the wrong question for Arabs to ask. The problem he sees with Arabs in Israel — including Palestinians in the West Bank and Gaza — is that they’ve adopted a narrative of victimhood that has led to political and intellectual intransigence. Once one side perceives itself as perennially oppressed, it is unwilling and unable to compromise. “Both sides did bad things,” he adds. The Arabs, of course, aren’t the only ones who think of themselves as victims in Israel. Jewish victimhood has been a reality of Jewish life beginning with biblical slavery and has its own set of consequences that endure. But where exile and a lack of political emancipation drove Jewish intellectual pursuits, Deek believes Israeli Arabs, in large measure, have been stymied by their own ideological obstinacy. As a result, Deek’s push for progress makes him a target. “I won’t show you Facebook messages calling me a traitor,” he says. The success of Arabs in Israel is one of Deek’s passionate pursuits. He often cites Arab Israelis, like himself, who have transcended communal small-mindedness to contribute to the world. He speaks in heroic terms of people like Johny Srouji, the Haifa-born tech wizard who serves as a senior vice president at Apple in California, and Ayman Sikseck, an Arab-Muslim author and literary critic from Jaffa, who writes in Hebrew. Deek wishes Israelis — and Jews — would give Arab Israelis more credit for their contributions. He laments that there hasn’t been a new Arab city established in Israel since 1948, even as dozens of Jewish cities have been established. He also rues the fact that so few Israelis speak Arabic, calling it “an embarrassment.” And he argues for more affirmative action policies designed to help Arabs avoid discrimination, something he has experienced firsthand. After graduating from law school, Deek began applying for jobs and for months received nothing but rejection letters. “I got replies like, ‘Thank you, but we’re not recruiting,’ ” he recalls. But when Jewish friends whom he outperformed in school were invited to interviews, Deek said he became suspicious. He performed a little experiment by sending out resumes with a “Jewish Ashkenazi name” and eliminated the note of his proficiency in Arabic. He says he heard back from about half of the law firms. “I didn’t do either,” he says, “because if I did, no one would take me seriously. [I’d be] the guy who was discriminated against, the victim. So I took the ‘Benyamin Zalmanovich’ CV and put it in a drawer, and continued applying under my name.” Eight months later, he finally landed a job. But he soon grew bored with routine legal work and decided to answer a newspaper ad seeking applicants for the foreign service. Deek’s manifold identity — Arab, Israeli, Palestinian, Christian — anchors him firmly on the fringe. At times, it seems he is at home everywhere; at other times, nowhere. One evening, Deek invites me to dinner in Tel Aviv with some of his Jewish friends, most of whom serve in intelligence or other roles in the Israel Defense Forces. Deek never served in the Israeli military because Arabs are exempt from the requirement, and perhaps it was for the better: He is critical of the army’s primacy in Israeli society. Some might even call Deek a pacifist for his belief that any culture deeply rooted in readiness for war and trained in violence is not a totally healthy one. But at the dinner, differences are set aside, and Deek is treated as an honored and beloved guest. As we sit at a long, rectangular table on the balcony, I start to feel a strange split myself. I am there as Deek’s guest, but suddenly I am sitting among my people and he is the outsider. Here, he is in the position of the Jew. A few days later, as we walk through a Jaffa park, Deek asks me what I thought of the dinner. 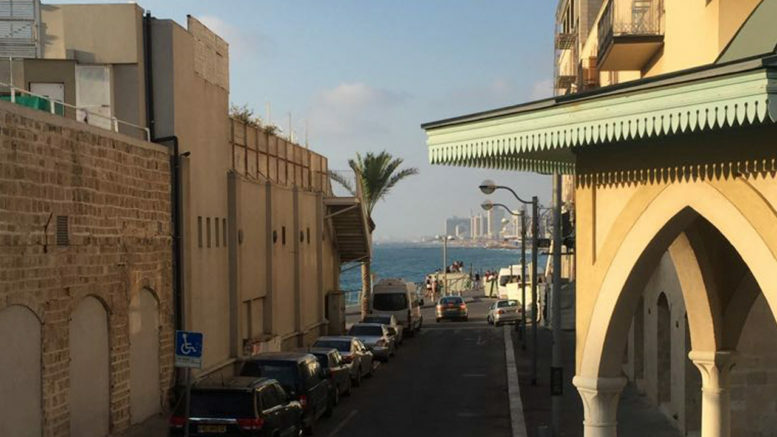 I tell him I experienced it through his eyes, just as I am experiencing Jaffa — and really, all of Israel — for the first time, through Arab eyes. At its core, there is a thread to Deek’s story that is a thoroughly Jewish one: the sense of being an outsider, of alienation, of belonging to the world but also to a specific community, of balancing loyalty to a tribe with loyalty to a country. The day after I first met Deek for an interview, at a Coffee Bean in Los Angeles, we coincidentally wound up on the same flight to Israel. That’s when we decided to meet in Jaffa, a more appropriate setting for this story. With time to kill before the flight, I sent Deek to Book Soup at LAX. When I next saw him, sitting a few rows behind me on the connecting flight from New York to Tel Aviv, he was reading “The Book of Aron” by Jim Shepard, a World War II story about a Jewish boy whose Polish family is driven by the Germans into the Warsaw Ghetto. Indeed, throughout our conversations, which took place over several months, Deek quoted a number of Jewish sources, religious and secular, from Rabbi Joseph Soloveitchik to Woody Allen. For a while, he told me, he attended Talmud classes on Sheinkin Street taught by his best friend, an Orthodox Jew. Although we spent many hours together, the elephant in the room was always Israel’s conflict with the Palestinians. While Deek is prolific in his macrocosmic thinking about the Arab world and hopeful about the rising fortunes of Arab Israelis, he is less voluble on the subject of the Palestinians in the West Bank and Gaza. He remains a proponent of a two-state solution but doesn’t seem entirely confident that there will be one. When I ask if he would prefer to live in a Palestinian state if that should come to pass, he says, “No.” Jaffa is his home, and there’s never been a question about Jaffa going to a Palestinian state. So, even though it may never be the place where he can live out full self-determination, it is his one and only homeland. And it is Israel. On the other hand, I can’t help but wonder what the Palestinian situation might be if a George Deek were among its leaders. In Israel proper, will he be able to go as far as he dreams? Could he ever win enough support to become prime minister someday? “Why do you hate me so much?” he jokes, the question striking him as the holy grail of his craft. But he takes it seriously. “I always say that the fate and destiny of the Arabs in Israel and the fate and destiny of the State of Israel are intertwined. If we have a better life in this country, the country will be in a better position; and if the country will be in a stronger position internationally, our status as citizens of the country would improve, as well. “Rabbi Soloveitchik said something that I like. He speaks about brit — the covenant of faith and the covenant of destiny. The covenant of faith is when you and others come together because of circumstances. He speaks about the Jews in Egypt, that because you are all slaves, and you happen to be in the same place, you have to work together to free yourself from slavery. “The destiny part comes at Sinai, when [the Israelites] are already free and then they choose a future together when they accept the covenant and the Ten Commandments. “In a way, in Israel, we’re in the same situation. Israel today is a covenant of faith,” he says. Circumstances brought Jews and Arabs together. “So we are forced to be together. We have to make it work. The question is, how can we make the Israeli identity not just a covenant of faith, but a covenant of destiny? So we choose what we want to be when we ‘grow up’ and make it our own.